Great, you're on your way. Now why not continue learning with more free tutorials? OK, so you’ve established your online home, and now you’re looking for ways to bring more customers to your virtual front door. Let’s discuss some great strategies to do just that using search engines, other websites, social media and email. So let’s talk about you, how are you going to get customers to find you online? There are a few ways to do it using digital. Let’s start with search engines. When people type something in a search engine, they’re letting it know exactly what they are looking for. If you offer relevant services and products, search engines will show your business in the search results. Now, there are two main ways you can use search engines, and we’ve got lots of info to share on both. The first is search engine optimisation, or SEO , which helps you promote your business in the unpaid search results. The second is search engine marketing, or SEM , which lets you buy ad space in the search results. SEO is all about getting your site in front of the right people who are searching for your products and services. Now, there are lots of ways to do this, we’ll explain them in detail later on, but the key is knowing what words people actually type in - the keywords. They are the most relevant words to your business. Understanding these will help you improve how you show up when these words are searched. SEM , on the other hand, is when businesses pay to advertise to people searching for specific keywords online. Most major search engines use an auction system, where lots of different businesses compete to show their ads by bidding on the keywords they’d like to target. Search is a great way to reach people, but we do lots more on the Internet. We read news, check sports scores, browse recipes, watch videos and generally browse lots and lots of interesting content across the web. Alongside all of this content you might see ads. This is called display advertising. Display ads appear everywhere online, and come in many formats like text, images, video, and ads you can click on and interact with. They can be a great way to get your message out there and you’re able to choose the people you want to see your ads, and the websites and pages you’d like them to appear on. Social media sites - like Facebook, Twitter or Google+ - give another option for boosting awareness of your business, and they’re especially useful for building relationships with customers. On most networks you’ll create pages or profiles for your business. You can then connect with lots of people by starting meaningful conversations and sharing content you’ve created whilst growing your business’ online social life. Before we wrap this up, let’s not forget one more pretty important way businesses can use digital: email marketing. We’re not talking about junk email, or “spam” that clutters up your inbox, but sending relevant information and offers to people who have already said they’d like to hear from you. You can get people to sign up, or “opt in” to receive emails from you. Then the rest is up to you. You can send coupons to people who have made an appointment on your site, advertise special events, or promote sale items. Knowing all the ways you can find people online—and knowing how they can find you—can help launch your business big-time. The more types of digital marketing you try, the more opportunities you’ll have to reach your most valuable customers, wherever they happen to be in the digital world. Software that can be used to automatically manage a search campaign, often to pre-set rules. The video version of a blog, where updates are new videos rather than written posts. A measure from 1 to 10 of how relevant your ads and landing pages are to the keywords you’re bidding on. Improving your Quality Score can help you achieve better ad positions and lower prices for clicks. The process of using email messages to share information and promote products and services. Creating online content such as blogs, videos or infographics to attract and engage a defined audience. The page being linked to from another page. E.g. “If you click the link to “Gallery,” you’ll see a destination page chock full of images of our fruits and vegetables. The sale of products and services online. A regularly updated website with posts written by an individual or a business, typically in a conversational style and focused on a specific subject. A calculation an advertiser uses to try to identify if their online marketing campaigns are profitable. One common formula used for calculating ROI is the following: return on investment = (gain from investment – cost of investment) / cost of investment. E.g. “The sales driven by our display advertising campaigns have demonstrated positive ROI this quarter”. Computer-generated simulation of a three-dimensional environment with which you can interact using equipment such as headsets, sensors or joysticks. 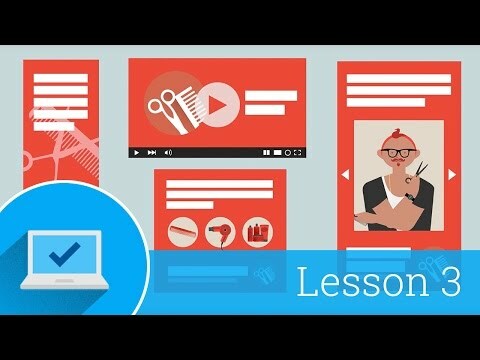 Explore more video tutorials, and start your free digital training today.